The GENETIC PARTNERS SALERS INFLUENCE COMMERCIAL FEMALE SALE offers an opportunity to put outstanding Salers-cross female genetics into your cowherd. We have teamed up with some of our most progressive bull customers to bring an outstanding offering of Salers-cross bred females and heifer calves. The sale will be held at Napoleon Livestock Auction in Napoleon, ND on Monday, January 8 2018 in conjunction with their regular stock cow sale. 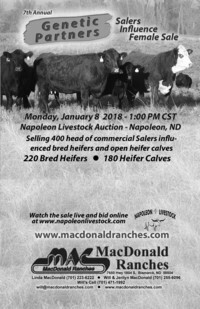 You can view and bid online by going to www.napoleonlivestock.com and clicking on the live auction button where you will be directed to the cattleusa.com auction site. If you would like to bid online, you will need to apply for approval prior to the sale.